Libu yunlüe 禮部韻略 "Concise rhymes from the Ministry of Rites" is a dictionary with characters arranged phonetically according to a rhyme system. It was compiled on imperial order by the Northern Song period 北宋 (960-1126) scholar Ding Du 丁度 (990-1053) and was finished in 1037. It was developed from a draft written during the reign of Emperor Zhenzong 宋真宗 (r. 997-1022) called Yunlüe 韻略 because it was shorter and more concise than contemporary dictionaries like Jiyun 集韻 or Guangyun 廣韻 because it was to be used for the preparation of the state examinations. These examinations were conducted by the Ministry of Rites (libu 禮部). Beginning of the (Fu shiwen huzhu) Libu yunlüe (附釋文互註)禮部韻略, Sibu congkan xubian 四部叢刊續編 edition, reproducing a Song period pring from the collection of the family Qu 瞿氏 from Changshu 常熟, Jiangsu (Tieqin Tongjian Studio 鐵琴銅劍樓). Click to enlarge. The Libu yunlüe contained 9,590 characters arranged in 206 rhyme groups (see Guangyun rhymes). The book has never attracted a wide scholarly interest because the rhyme groups are identical to the much larger dictionary Jiyun, and like the latter, it remarks whether a rhyme was used for one rhyme group alone (duyong 獨用) or as unified group including several obsolete rhyme groups (tongyong 統用, 同用). In one word, the book was redundant. The original dictionary is lost, but two versions of 5 juan of length survive. The first version has two prefaces, one written by Yuan Wenyu 袁文焴 in 1230, and the other by Guo Shouzheng 郭守正 in 1264. This version, a comments on which was compiled by Ouyang Xiude 歐陽德隆 (his comment was originally published in the book Yayun shiyi 押韻釋疑), is called Fu shiwen huzhu Libu yunlüe 附釋文互注禮部韻略 or Zengxiu jiaozheng yayun shiyi 增修校正押韻釋疑. It contains phonetic explanations in the official language (guanhua 官話, hence called guanzhu 官注 "official notes"), as well as remarks to it ( 互注 "mutual comment") in respect to the vernacular language. The compiler of the commentaries and remarks is unknown. The version survives in two editions, the first being a print by Cao Yin 曹寅 (1658-1712) from 1706 (the Lianting wu zhong 楝亭五種 edition, part of a collection of five books – Lianting 楝亭 was Cao Yin's style). A facsimile of this edition published by Yao Qinjuan 姚覲元 (1823-1890), the so-called Yao ke san yun 姚刻三韻 edition which also includes the books Leipian 類篇 and Jiyun. The latter version is the one enriched by the prefaces of Guo Shouzheng and Ouyang Xiude. The second edition is the facsimile of a Song period print reproduced by Qian Sunbao 錢孫保 from Changshu 常熟. This version does not include prefaces, but a long list of errata which results from Song period research on the text (Gongju tiaoshi 貢舉條式), as well a numerous critical remarks on the text itself. 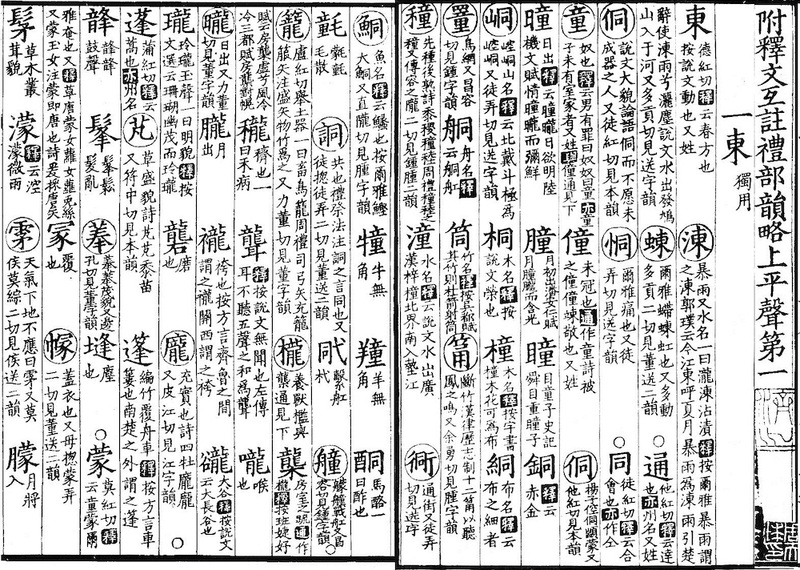 The remarks refer to characters which have two different pronunciations, but both with the same meaning (zi tong yi er you liang yin 字同義而有兩音), characters with a very similar, but different, meaning which were used wrongly in the the Confucian Classics and their standard commentaries on them (zi yi bu tong er jing-zhuan duo wu yong 字義不同而經傳多誤用), characters often used in the Classics, but not included in the original version of the Libu yunlüe, and characters or phrases which were wrongly believed to include a taboo character (personal name of an emperor). 【攻】一上平聲，東字韻，古紅切，一上平聲，冬字韻，姑宗切．皆曰治也，擊也． The character 攻 has two readings, namely /kuŋ/ (rhyme group 東, level-tone first group) and /kuoŋ/ (rhyme group 冬, level-tone first group). Both mean "to check", "to attack". 【猒】下平聲，鹽字韻，於鹽切，飽也．【厭】去聲，豔字韻，於豔切，足也．【饜】去聲，豔字韻，於豔切，飫也． The character 猒 is pronounced /jĭɛm/ (rhyme group 鹽, level-tone second group) and means "to eat one's full". 厭 is pronounced /jĭɛm/ (rhyme group 豔, falling-tone group) and means "sufficient". 饜 is [likewise] pronounced /jĭɛm/ (rhyme group 豔, falling-tone group) and means "satisfied". There is another version surviving with the same size. It was revised and commented by the Southern Song period 南宋 (1127-1279) scholar Mao Huang 毛晃 (jinshi degree 1151) and was printed by his son Mao Juzheng 毛居正 (fl. 1223) in a text-critical edition under the title Zengxiu huzhu Libu yunlüe 增修互注禮部韻略, and submitted to the throne in 1162. It contains 2,655 characters more than the original Libu yunlüe, as well as 1,691 character variants (called juanzi 圈字 because they were marked with a circle). Mao Juzheng added further (chongzeng 重增) 1,402 characters. This version is included in the imperial collectanea Siku quanshu 四庫全書, based on a Sichuanese print from 1256. Other copies from the Yuan 元 (1279-1368) and Ming 明 (1368-1644) periods survive. Under the reign of Emperor Aizong 金哀宗 of the Jin dynasty, Wang Wenyu 王文郁 (fl. 1227) compiled the dictinary Shuiping xinkan yunlüe 平水新刊韻略 with the reduced 106 rhyme groups. It was aimed for use for the state examinations. Somewhat later, Liu Yuan 劉淵, living in the Southern Song empire, finished in 1252 (the year with the cyclical signs renzi 壬子) the 106-rhymes dictionary Renzi xinkan Libu yunlüe 壬子新刊禮部韻略. It is believed that this book was in fact only a revision of Wang's book, and not a revision of the original Libu yunlüe from 1037. The difference between the books of Wang and Liu was in the integration of the rhyme 拯 /tɕĭəŋ˥/ into the group 迥 /ɣiweŋ˥/. The simplified arrangement in 107/106 (迥 /ɣiweŋ˥/ merged with 拯 /tɕĭəŋ˥/ and 等 /təŋ˥/) rhyme groups was cemented half a century later by Yin Shifu 陰時夫, who created the so-called pingshui rhymes 平水韻 in his dictionary Yunfu qunyu 韻府群玉. The 5-juan long Renzi xinkan Libu yunlüe has not survived, but a short description is preserved in Xiong Zhong's 熊忠 Gujin yunhui juyao 古今韻會舉要, which is itself a commented version of Huang Gongshao's 黃公紹 (jinshi degree 1265) Gujin yunhui 古今韻會. A copy was apparently still available during the early Qing period 清 (1644-1911), as Qian Daxin 錢大昕 (1728-1804) reports that he had seen an original Yuan period print, but Qian held that Liu Yuan was just an editor of the book and not the compiler. Dictionaries of this type are also known with the names Pingshui yunlüe 平水韻略, Xinkan yunlüe 新刊韻略, or Pingshui xinkan yunlüe 平水新刊韵略. A Qing period manuscript copy with such a title is preserved in the Peking Library (Beijing Tushuguan 北京圖書館). This reduced rhyme system served as the basic rhyme system (shiyun 詩韻) for early modern Chinese that was in use until the end of the Qing period. It is adopted in Qing period rhyme dictionaries like the Peiwen yunfu 佩文韻府. Cao Shujing 曹述敬 (1988). "Yunshu 韻書", in Zhongguo da baike quanshu 中國大百科全書, Yuyan wenzi 語言•文字 (Beijing/Shanghai: Zhongguo da baike quanshu chubanshe), 505. Cao Shujing 曹述敬 (1991). Yinyunxue cidian 音韻學辭典 (Changsha: Hunan chubanshe), 43, 119, 294. Guo Qinna 郭芹納 et al, ed. (1990). Jianming gu Hanyu zhishi cidian 簡明古漢語知識辭典 (Xi’an: Shaanxi renmin chubanshe), 42, 49, 67. Li Xueqin 李學勤, Lü Wenyu 呂文鬰, ed. (1996). Siku da cidian 四庫大辭典 (Changchun: Jilin daxue chubanshe), Vol. 1, 768. Pan Yinsheng 潘寅生, Guo Jiankui 郭建魁, ed. (1993). Zhonghua shehui kexue gongjushu cidian 中華社會科學工具書辭典 (Lanzhou: Gansu renmin chubanshe), 368. Wang Li 王立 (1992). "Libu yunlüe 禮部韻略", in Zhou Gucheng 周谷城, ed. Zhongguo xueshu mingzhu tiyao 中國學術名著提要, Yuyan wenzi 語言文字卷 (Shanghai: Fudan daxue chubanshe), 12. Yu Min 俞敏 (1988). "Pingshuiyun 平水韻", in Zhongguo da baike quanshu 中國大百科全書, Yuyan wenzi 語言文字 (Beijing/Shanghai: Zhongguo da baike quanshu chubanshe), 308. Wu Feng 吳楓, ed. (1987). Jianming Zhongguo guji cidian 簡明中國古籍辭典 (Changchun: Jilin wenshi chubanshe), 274. Yang Ling 楊凌 (1997). "Libu yunlüe 禮部韻略", in Men Kui 門巋, Zhang Yanjin 張燕瑾, ed. Zhonghua guocui da cidian 中華國粹大辭典 (Xianggang: Guoji wenhua chubanshe), 700.